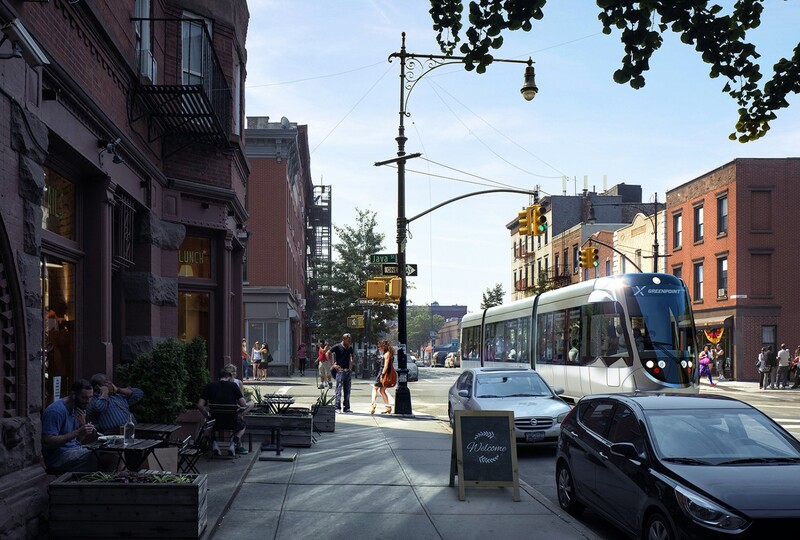 Picture the Brooklyn-Queens waterfront, seven years from now: There will be a new garment district, design fairs, and expanded ferry service, but the city wants residents to see a streetcar, carrying passengers between the neighboring boroughs. Leaked information suggests, though, that plans for the brand new line may have to wait. Politico this week released a draft of a confidential memo from the Mayor Bill de Blasio’s BQX advisory team to Deputy Mayor Alicia Glen that outlines some of the challenges behind its developer-driven financial model, among other issues. The mayor officially declared the Brooklyn Queens Connector (BQX) a priority project during his February 2016 state of the city address. The proposed 16-mile, $2.5 billion streetcar line would run along the waterfront, connecting Sunset Park, Brooklyn, to Astoria, Queens. Unlike a new subway line under Utica Avenue or phase two of the Second Ave Subway, supporters say BQX could be built without financing from the MTA, which is run by the state, not the city. Instead, local backers like Doug Steiner and the Walentas family have endorsed a value-capture model, where the project would be financed by rising property values along the streetcar route. Another selling point was its tight timelines. The city estimated that the project could break ground two years from now and begin ferrying passengers up and down the waterfront by 2024. At one community meeting, a representative from Sam Schwartz, the project’s transportation consultant, noted that relocating below-grade utility lines would be a challenging (and costly) aspect of the project, but it turns out the city is having serious second thoughts about the feasibility of relocating gas, water, and sewer mains: “Utility relocation continues to be the biggest single cost factor and if policies cannot be implemented to limit the impact, it has the possibility to make the project unaffordable and render implementation timelines unfeasible,” the memo states. The letter outlines three possible timelines, fast to slow, to gauge the costs and benefits of breaking ground sooner rather than later. The memo suggests taking more time to study and review the project before making a final decision, though that would delay the groundbreaking, now set for 2019. But, the memo cautions, every year the project is delayed adds tens of millions more to the bill. Construction on the line was initially expected to take five years, but if the city chooses a longer timeline, construction costs will rise approximately $100 million per year. The BQX team, according to Politico, meets bimonthly to discuss the project. If value-capture won’t work and the streetcar proves too costly, the city may look into other financing models, or the BQX may be abandoned.